For our twenty-third Cook-Off, we're making crêpes. There's been an intense push for a crepe cook-off for many months, and we've finally arrived! Crêpe originates from Brittany, a region in the west of France, where they are called krampouezh; their consumption is nowadays widespread in France. It is said that crêpes were born in this region because they couldn't grow enough wheat to bake bread due to the poor land. 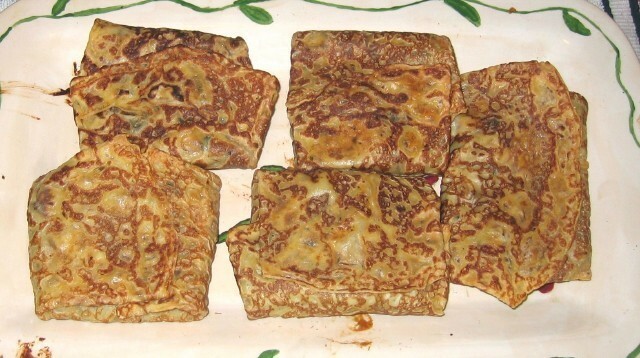 Buckwheat came to Europe from China and also spread to Eastern Europe, where a similar meal called blintz also developed. In Brittany, crêpes are traditionally served with apple cider. 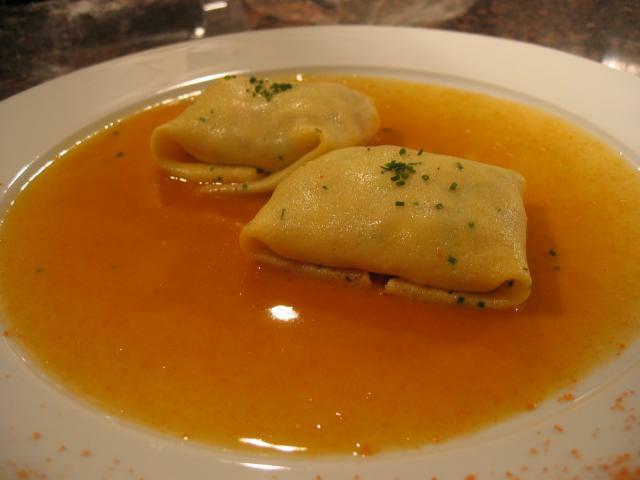 In areas of Central Europe, the meal is called palačinka (Czech, Slovak, Croatian and Slovenian), Palatschinken (Austrian), palacsinta (Hungarian), all these terms being derived from Romanian plăcintă (Latin placenta meaning "cake"). In most German regions it's Pfannkuchen, in Dutch pannenkoeken, derived from the words "pan" and "cake". In addition, there are banh xeo, the Vietnamese crêpe, banh chiao, the Khmer version, dosas from India -- heck, I think you could make the argument that injera is something of a crepe. 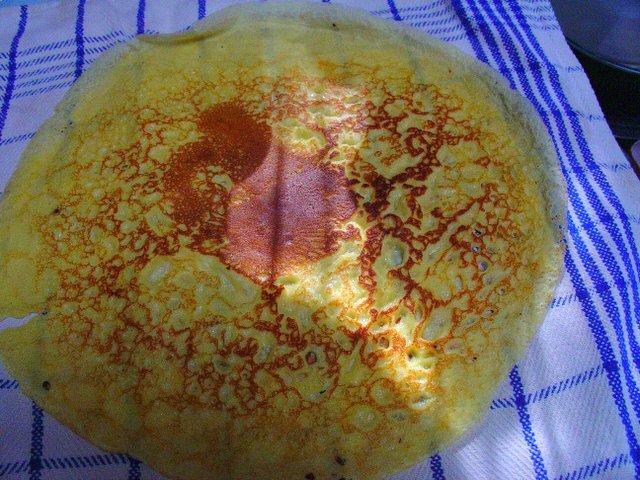 So far on eG Forums, we've got a General topic devoted to crêpe fillings, a Pastry & Baking topic devoted to crêpe technique, a topic on Japanese crêpes (which are pretty eclectic, let me tell you), another on injera, and a topic and recipe devoted to mille crêpes. I also found this charming pictorial how-to, which would suggest that you need neither a fancy crêpe pan nor one of those T-thingies to push the batter around. Let's see some crêpes, folks! That's a thing of beauty, Sam. What's the diameter of that pan? I'll be right over, Sam. What did you say your address was? Ok, perfect timing for me. I was given a pan, and it's huge (although Sam's looks huge too). Mine's maybe 10", and it's not non-stick. And I can't get it to work worth a damn. And I know a crepe is the easiest thing in the world to make, but I quail before that pan. Help! Sam, do you temper that pan? I think that's what mine would look like if it weren't currently more of a dull silvery gray. A timely topic as I made crepes over the weekend and on Monday. Saturday was Seafood Crepes from the Prudhomme cookbook. Sunday was more crepes with a Tarragon Chicken filling adapted from a Craig Clairborne NYT cookbook. I use the Prudhomme recipe, thinned a bit more than per the recipe. 1 cup milk, 2 eggs, TB oil, pinch salt, 1 TSP sugar, 1/4 tsp nutmeg, 3/4 cup flour plus 1 TB. I usually double everything except the sugar and nutmeg. I have a steel crepe pan with a long skinny spatula (came as a kit). It's a 10" pan I guess. Medium heat, 1/3 cup batter swirled for coverage (I don't like to pour off back into the pan). If I get the urge I'll make some tomorrow and photograph the process. Great timing, Chris. I've been meaning to make some, it's been ages and a good friend recently gave me a lovely new crepe pan (NOT non-stick). Growing up I spent a lot of time in Quebec and a friends mother would often make us crepes en salade for lunch with a crepe and maple syrup for dessert. I miss that.....that'll be the first meal for sure! I'm not exactly sure. Around 9 or 10 inches, I'd say. Yea. You season carbon steel just like you do cast iron. Sometimes if I haven't used it in a long time, I'll scour it a little bit with steel wool and reseason it. In fact, you're sort-of supposed to reseason the pan every time you use it. Heat it up with some shortening in the pan, let it stay hot for a while and then wipe it out. I find that getting the temperature just right is key to avoiding sticking, but once you hit that sweet spot you can easily bang out crêpe after crêpe after crêpe in short order. Sam, beautiful looking crepes. I have a black steel pan also (maybe mine is blue steel), but eventually switched to a non-stick pan for crepes because I couldn't seem to get the temp right, and the crepes would sometimes stick. 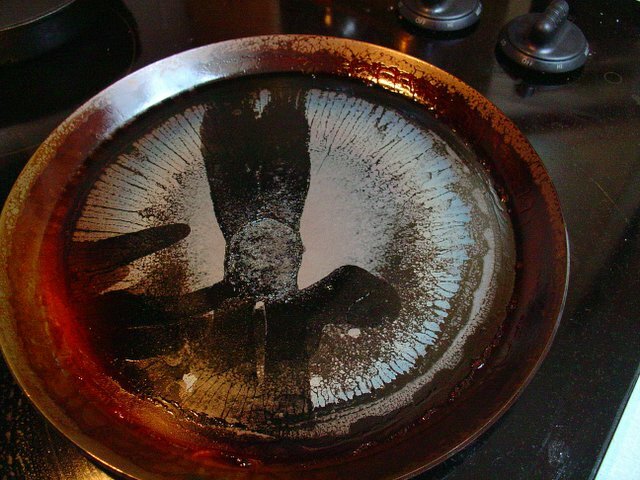 My pan is well seasoned. But could you give us an idea of how hot you want the pan? For example, about how long before the batter bubbles as in your second picture -- is it 3 seconds, or more like 15? I also noticed that you don't use a crepe spatula (or whatever that thing is called that is about 1 inch wide, 8 inches long, and has a bend in it). Do you find that the spatula pictured below works well? I don't have the crepe spatula either, because I don't make crepes enough. Lastly, I noticed you didn't put wax paper between the cooked crepes. Do you find they stick together at all when they cool? But could you give us an idea of how hot you want the pan? For example, about how long before the batter bubbles as in your second picture -- is it 3 seconds, or more like 15? 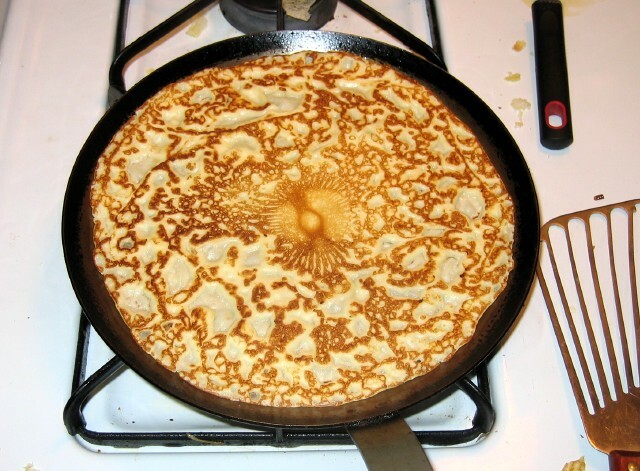 My crêpe batter tends to bubble somewhat immediately after it hits the pan. It's usually a race to get the batter spread out over the whole surface of the pan before it sets up. You're talking about an offset spatula. I've never found them to be particularly useful for making crêpes. The spatula shown in my picture is called a Peltex spatula. I like this one for crêpes because it's thin enough to get under the crêpe with ease, and the wider surface area affords more support. The Peltex is also awesome for delicate fish. That said, if I've really hit the groove, I don't need any spatula at all. 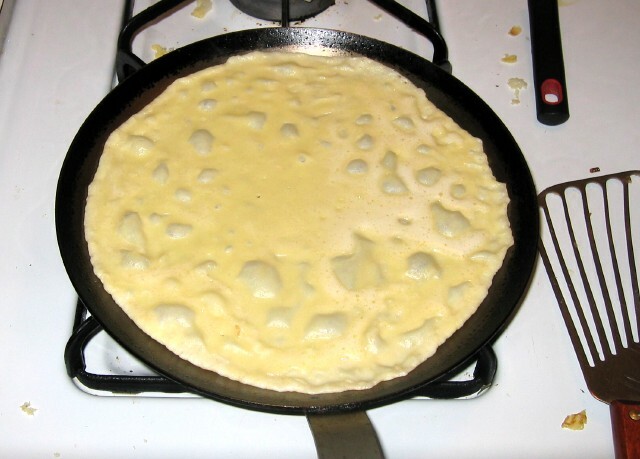 I just shake the pan to loosen the crêpe after it has set up, and then flip it in the air. No spatula required. I've never had a sticking problem. If you are having this problem, it may be partly due to undercooking the crêpes (this is a guess based on thinking that your cooking temperature may be too low). I also have a procedure I use when making crêpes in bulk: When a crêpe is done, I slide it out of the pan onto a thick, clean dishtowel. The crêpe then cools off while I am pouring the batter for the next crêpe. After I have flipped the new crêpe, I transfer the cooled crêpe to the stack and then slide the new crêpe onto the dishtowel. This allows each crêpe to "steam out" a bit before being added to the stack, and I think it helps to reduce the risk of sticking. Any thoughts on how thin a crepe should be? To clear up my language confusion here.. what Americans call a pancake, is not the same as a crepe, right? The Dutch pannenkoek is the size of the crepes in Sam's pictures, but much thicker though. That's right, Klary. 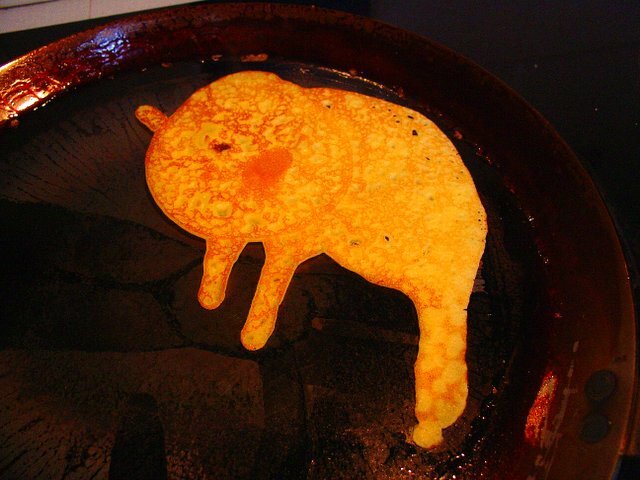 A pancake is about 1/4-1/2 inch thick, sort of like a blini, but usually bigger in diameter. A crepe doesn't have the leavening in it a pancake has, so it stays quite flat, like a piece of paper. Sam (or anyone), I have a Sitram stainless skillet and a Calphalon non-stick griddle. Thoughts on which I should use? Or should I do a side-by-side and find out? Sam, it looks like you're the resident expert on this one. I'm going to go season my skillet right now, but since I don't have or ever use shortening, I'll use canola. Can you share your recipe? I know they're pretty standard, but I want crepes that look exactly like yours do. I'm going to go season my skillet right now, but since I don't have or ever use shortening, I'll use canola. 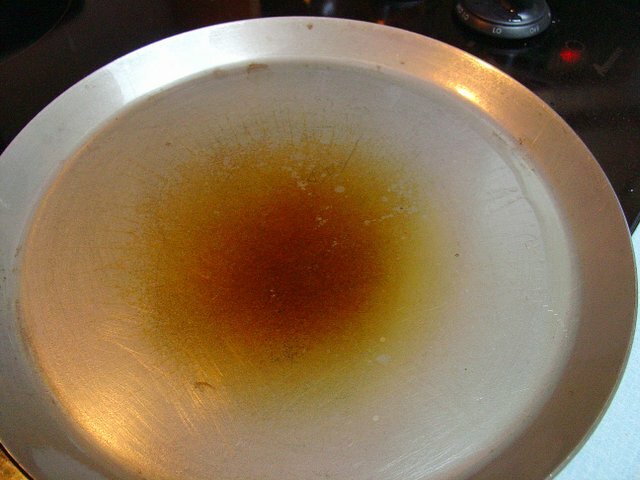 Don't forget that you want to reseason the pan just before using it. Liquids and eggs into the blender. Turn it on and drizzle in the flour until combined. Let the crêpe batter sit preferably for an hour before using it. You can thin it out with more water for a thinner, more delicate crêpe. There's an intriguing recipe for crepes in Rose Levy Beranbaum's The Cake Bible. If I recall correctly, it contains little or no wheat flour, ensuring ultimate tenderness. Has anybody tried it? I am on the fence as to whether savory or sweet French crepes are superior. I love them both dearly. I am admittedly a French crepe devotee and have never tried cooking any other sort of thin pancake--even though I adore other thin pan-griddled breads. I think of Bedouin pita as a crepe of sorts, along with mu-shu pancakes and Indian dosais. Does anybody make any of those at home? Yes, I use RLB's recipe for chantilly crepes all the time, mostly for its convenience (no need to rest the batter). I like the results but don't have a point of comparison, since I usually make crepes in the morning and don't have time to make a regular crepe batter. i've made mu-shu pancakes a couple of times. it was surprisingly easy. but i don't know if i'd consider them crepes, really, since they weren't made with a liquid batter but rather with a dough. (the procedure is that you take two pieces of dough, oil them and then press them together and roll two at once, in order to be able to roll them thin enough. then you cook them on a hot pan and separate them) actually they're similar to tortillas or pitas or nan in that way--dough cooked on a hot surface. of course that's just my definition of things. i could very well be wrong. I'm not sure if this is helpful at all in this context of the home kitchen, but I thought a technique I've witnessed could be inspiring. I just got back from a crêpe pilgrimage to Toronto I make from time to time. The place that keeps drawing me back is called Le Papillon, and they make their crêpes on a big flat-top grill. They're never flipped, stacked or moved: the batter is poured onto the flat-top, troweled-out to a paper-thin film, then as it starts to set-up, the fillings are put on top, while it's still on the grill, then it's folded-up, put on a plate, and served immediately. I know not many of us have huge flat-tops at home, but I thought some of the technique could be useful: the texture of these crêpes is mind-blowing, they're both crispy and soft, elastic yet firm. And I think that comes from the heat on one side only, and from their not ever sitting in a stack. I've seen a similar technique in Paris, at a little place that used the smaller, domed Breton griddles. They too never flipped the crêpes, just put the filling on as the batter firmed-up (I don't know how they managed to prevent the ingredients from rolling off the convex surface, I chalked it up to pure intimidation.) Moments later, the edges were folded-in, the whole thing got slid onto a plate, and we were eating it seconds later. Those had the same multi-textural thing going on, and were excellent. I made some crepes for lunch. My camera is at home so I couldn't take pictures. They were lovely. Really . Filled them with a mushroom/onion/cream/swiss mixture. Delicious. 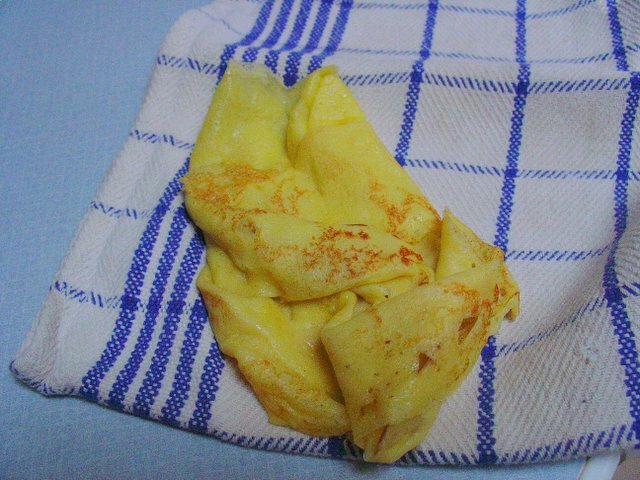 I hope to make some blintzes in the near future. They're a crepe. I use a wheat flour-free batter with potato starch instead. Wow !! Did you smuggle some in for me Philadining? yeah, i saw that in paris too, but have never tried it at home. gimme about five years of pancake and french toast making, scraping with a metal spatula to get this new lodge griddle smoothed out, and i'll give it a test. My dad reports that his mother (who spoke French, and almost no English) made outstanding crepes. She died before I was born, though, so I never go the chance to judge myself. Perhaps this cookoff is a good incentive for a tribute. Oh yeah, and I love having extra vehicles for Nutella around the house. Ok Sam, instant feedback/retribution! This series of photos will make everyone else feel a lot better about their own crepes. 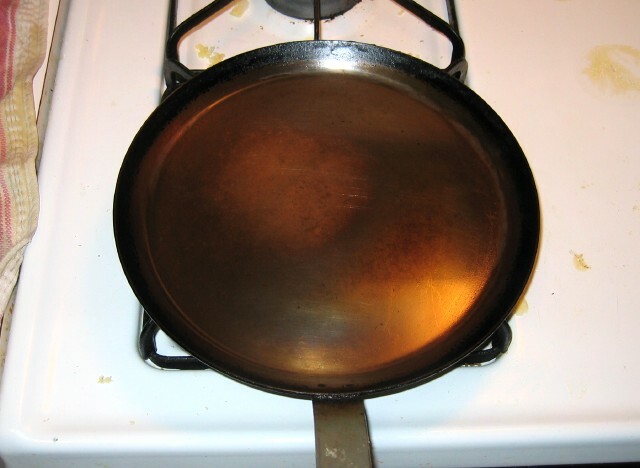 I start seasoning my untempered pan. When I see it look like this I feel like a moron. Carbon steel, just like my wok. Needs to be seasoned. Now why didn't I think of that before? Nasty junk starts burning off and I have to turn on the fan. Perhaps I go a little overboard with wanting to burn off the crud. Here the pan is actually white hot, except for the parts that are burnt black. Uh, crepe number 1. But the first one's always bad, right? Crepe number 2. Hmmm. Evidently we're having a "sunbreak." Crepe number 3. Hey, got to admit it's getting better. So, my issues are: mine aren't nearly as evenly browned as Sam's are. That's probably the fault of my ceramic cooktop. Nothing I can do about that. Or maybe the patina will even out with more use? 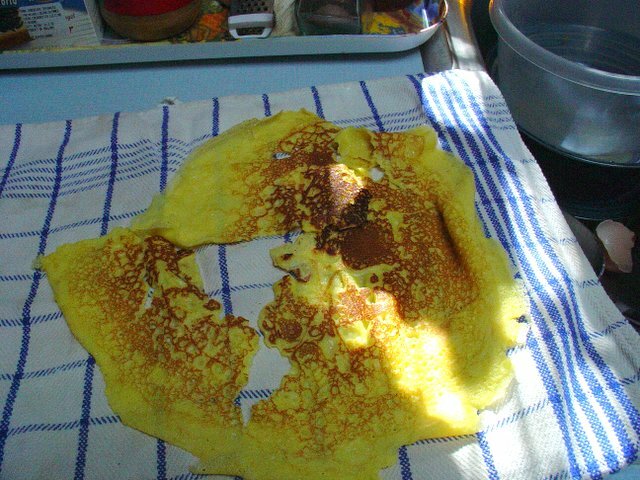 And I only got 7 usable crepes out of the one recipe, nevermind the two that were hopeless. Probably I should have thinned the batter. And I keep seeing recipes that call for 2-3 T of batter per crepe, but I had to have 1/3 C, or 5 T, to fill my pan completely. They aren't thick, per se, but probably should be a lot thinner, based on how many Sam has in his stack. Think I could sell this on eBay to some cat worshippers? I LOVE crepes. This is kind of a lame repost from a meal a couple weeks ago, but if it gives someone an idea, then it'll be worth it.